Dante Benedetti was born under the stubborn sign of Taurus, and they had to slap him ten times before he would cry. Still stubborn at 81, Dante (after the famous Italian poet) sits beneath a wall cluttered with his coaching trophies in the New Pisa, one of the last of North Beach's original Italian restaurants. The quintessential New Pisa, owned and operated by Benedettis since 1927, still serves dishes Dante's mother, who always used fresh tomatoes, once prepared. "Same food, different prices," says Dante, recalling his father's 70-cent dinners, a pretty penny back in the depression days. Dante was born in Jasper Alley, behind the New Pisa. "I was born in the alley. Number 27 . . . Midwife!" he gruffly explains. Dante entered this world in 1919, the same year 4,000 chickens blew away in a freak storm in Napa and mail was transported from Toledo to Presidio in a record breaking 54 hours and 22 minutes by army air service biplane. 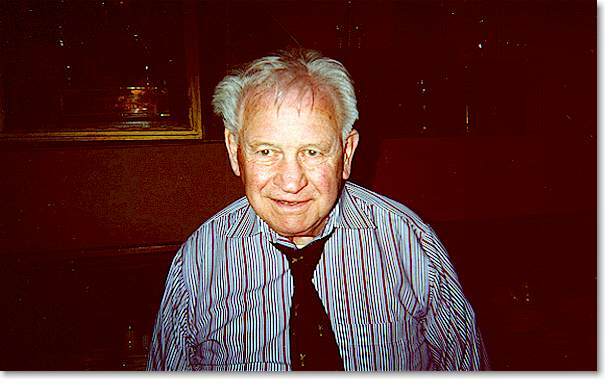 His earliest memories are of sleeping in his family's restaurant underneath the bread box. But owning and operating one of the finest restaurants in North Beach was never Dante's main interest in life. His true love has always been baseball, playing it and most of all coaching it. 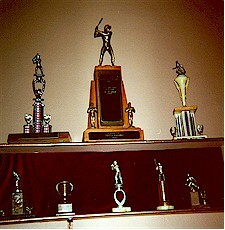 Using proceeds from his restaurant business, Dante was able to sponsor and coach eight teams at a time for many years. Because of this, he has become something like a local saint. Boys whose lives he touched still come up to him to say thank you. "The restaurant business was my livelihood, but my hobby was always coaching," he says, "and I enjoyed it very much. Especially the little guys, though I had to coach the parents more than the kids." Dante started playing ball as a boy with Joe Dimaggio and his brothers in the Marin Del horse lot on Bay Street. The lot has long since been replaced by houses, but it was once the perfect place to knock a few balls around. While the horses were out on their milk rounds, the boys would put the bases together. Dante recalls that when it came to choosing teams, the Dimaggio boys were always picked first. Dante paints a picture of a North Beach that no longer exists. A North Beach where nobody locked their doors and the neighborhood boys played soccer every night in the street. Peddlers used to go door to door, selling everything from vegetables to light bulbs. It was a North Beach peopled by families, where folks helped each other out. He remembers one family of 11 children. "The father was a bootblack down at the Ferry Building," says Dante with the intonations and gestures of the great storytellers of old. "He didn't earn enough for a livin', see? After dinner at night you'd see half the alley that had something left over bringing it over to her so she could feed those 11 kids. You look at the same alley now, you got iron bars on the windows and iron bars on the doors. You have to have three keys to get into a normal house in Jasper Alley these days. Back then, see, we never locked our doors. Back then it was Little It'ly," he says. His father had immigrated from Northern Italy in 1911, the year women in California were granted the right to vote. His wife, Amelia, followed three years later, in a year in which women were accused of misusing their new political privileges by "always voting for the handsome blond man." Upon arrival in the New World, Mr. Benedetti went to work as a logger in Mendocino county. His wife's uncle, however, was making more in one day in the restaurant business than Benedetti made in one month cutting down trees. They moved to San Francisco where he worked hard as a waiter, saved every penny, and in 1927 bought his own restaurant. Dante grew up in the New Pisa, "mostly eating." His mother was the cook (and made everything from scratch every single day) and his two sisters were waitresses. "Course in those days there was a little bootleggin'," whispers Dante. The original New Pisa had four booths equipped with curtains, where patrons could enjoy the fruit of the vine with their spaghetti. Before Prohibition, San Francisco had been known as the "wettest city in the west," as it had more bars per capita than any other American city. During Prohibition, the law allowed an Italian family to buy no more than $200 worth of grapes, in order to make wine for the elderly members of the family. "But they all cheated and bought $2,000 worth," laughs Dante. "They used to call Jasper Alley Wine Alley in those days." The best lesson Dante ever learned was while helping his dad distill wine for the restaurant. He didn't know you weren't supposed to inhale the fumes and before he knew what was happening he was rip-roaring drunk. The he got sick. "Never touched liquor since," he says, "except for maybe a shot of whiskey here and there for medicinal purposes." Though raised in the restaurant business, all four Benedetti children went on to pursue careers in education, working together to keep the New Pisa open after their parents' deaths. Dante would open the restaurant in the morning before going to San Ignatius High School, where he taught Spanish, Italian and Sports. His sister would manage the place until he returned after school to close up for the night. In addition -- and at his own expense -- he coached baseball at various parks throughout the city. Later, he coached baseball at the University of San Francisco, where he remained for 29 years, taking occasional breaks to run baseball clinics in Italy. He admired his relatives in Italy who found pleasure in the simple things in life, who never had more than what was necessary and who had no interest in where the boundary line on their property lay. "I started coaching baseball at USF because they were going to drop it from the school," explains Dante. "I had played baseball for many years and coached kids, so I called up the athletic director and I says, 'How come you're droppin' baseball?' and he says, 'Cause we can't afford a coach,' and I says, 'Well, I'll coach for nothin'.'" By law, Dante had to sign a contract for a least a dollar a year, which he did. After 29 years, he had made 29 dollars. Such pure love of the game is what is missing from baseball today, according to Dante. Like all great baseball enthusiasts, he sees baseball as a metaphor for life. Leaning back in his chair, he prepares himself before divulging his own personal pearl of wisdom. "Baseball is like the game of life," he begins. "When that ball starts to roll, you have to anticipate, execute; and if you don't execute well, then you had better start practicing, because if you don't you won't enjoy the game. It's the same in business. When you open up in the morning, it's like that ball starts to roll, and you've got to anticipate what you're going to do and then you've got to execute it. If you can't anticipate and execute, you won't be open long." For Dante, the point has always been TO ENJOY. Money he never cared for. He spent it and gave it away. He lent it to people who never repaid him. Most of it went towards his baseball teams, which used to drive his mother crazy. "You stupid Americans," she used to say to him in Italian, "you don't even know how to play with your own balls and you're learnin' to play with all those other balls!" When Dante laughs, which is often, it comes from deep within him; and it pours forth generously, contagiously. As for romance, Dante Benedetti's approach may not have won most ladies' hearts, but it did win him a special gal that remained his loving wife until her death 16 years ago. He met her walking up Montgomery Street. "There's this chubby girl walking up Montgomery Street every day, and she's plump, you know, really. . ." he searches for the right word, "well-built. Jeez, she weighed 150 pounds! And I didn't like thin girls, so I go, 'Hey, what's doin' chubs?' Took her two or three months before she answered me. Every single day I used to wait for her to take her break -- she worked on sewing machines -- and finally one day she goes, 'Who in the hell told you my name?' It was her nickname, see?" She was Russian, and Dante's mother wanted him to marry this Italian girl from Watsonville. She had arranged it all with the girl's parents. But when he came home from the service, Dante called up the Russian and told her to meet him in Carson City, where they were married without further ado. He didn't tell his mother about it for six years, though she was a little suspicious when he didn't come home as often as before. When he did tell her, she didn't talk to him for seven years. "My wife tried hard to give me a son, but I got two wonderful daughters," he says. Without fail, one calls him every morning and the other calls him every evening. Dante isn't as quick on his feet as used to be. 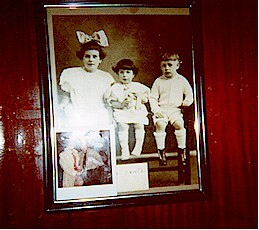 He takes him a while to negotiate the crowded dining room where pictures of him and his family decorate the walls. 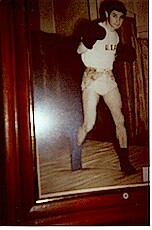 He points to a photo of himself in his boxing days, when he won 89 amateur fights. Five years ago Dante sold the New Pisa restaurant, photos and all. He sold it under one condition: that he could hang around whenever he wanted. He stands at the door greeting customers, and many who know who he is pay their respects. "He's an amazing, man" they say, and "He's the last of the legends." "Hell, I'm 81 years old," he says, "I'm not dating anymore. I'm home alone, so I come down to the restaurant. If I met somebody that liked to go out to dinner now and then and was good company, I'd be happy, though the romantic end of it is gone. I'm ashamed to admit it, but that's how it is. I can still kiss a little bit, but the rest of the stuff they're doin' nowadays? Nah...."